The belltower of Saint-Pierre de Bessuéjouls is a remarkable vestige of the Pilgrimage Road. The Compostelan pilgrims who travelled the route from Le Puy descended into the valley of the Lot River after they had crossed the wilderness of the Aubrac plateau. They reached the Lot at Saint Côme d’Olt and proceeded along the river to Espalion. Rather than continue along the river valley however, they branched off towards one of the most celebrated shrines in western Christendom, the remote abbey of Conques and the shrine of Sainte Foy. Taking this route, after a short distance from Espalion, pilgrims came by an isolated priory, Saint Pierre de Bessuéjouls. 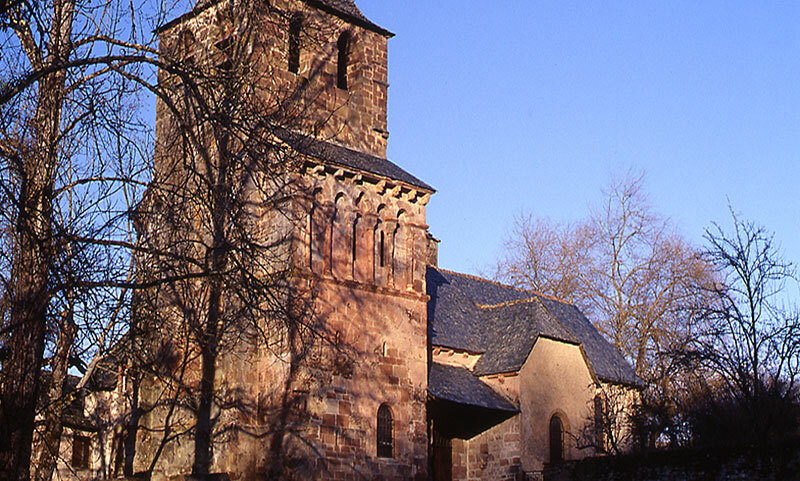 The church was set within the small wooded valley of the Astruges. The name Bessuéjouls was derived from the Celtic meaning “a clearing in the woods”. Saint Pierre was part of the domains of the Augustinian abbey of Notre-Dame de Pébrac located some seventy miles further up the pilgrimage road towards Le Puy. Today, all that remains of the church of Saint-Pierre is the west porch tower. The sizeable dimensions suggest that the main body of the church would have been a substantial edifice, sufficient to service the pilgrimage traffic en route to Conques. The tower featured a pair of narrow stone staircases on either side. These led up to a small chapel where lay a stone altar carved with an image of Saint Michael slaying the dragon of the Book of Revelation. This chapel had originally formed a tribune overlooking the nave of the old church and was dedicated to the archangel. The practice of constructing shrines dedicated to the angel of the Apocalypse in elevated locations had originated at Monte Gargano in Apulia. It was there in the year 490, that the first apparition of Saint Michael in western Christendom had occurred. The sanctuary which was built to commemorate the event rapidly became one of the most important Christian pilgrimage sites in all Europe. Other examples had followed, notably at Mont Saint Michel in Normandy and Saint Michel l’Aiguilhe at Le Puy-en-Velay. On the pilgrimage road in Spain, the church of San Miguel is located on a hill dominating the town of Estella. During the Carolingian period it had become the practice to dedicate an altar to Saint Michael on the upper floor of west facing narthexes or towers. The church at Bessuéjouls followed in that tradition and its altar and other decorative elements featured interlace designs which continued Carolingian styles. As there could be no earthly relics for the archangel, so it would seem natural not to have his shrine associated with a reliquary and an altar in an elevated site would correspond to his heavenly status. According to a twelfth century compendium of liturgical practice, the Divinorum officiorum explicatio, Saint Michael had determined this arrangement himself. “In making his appearance on Mount Gargano,” wrote the author, Jean Beleth of the archangel, “he chose himself the high place and for that reason, wherever in the world his church is constructed, it is in such a place”. The location of a shrine dedicated to Saint Michael above the western entrance to the church was significant in another way. In a number of Romanesque porches the sculptural complex includes an image of Saint Michael slaying the dragon, an example being in the narthex at Vézelay. With reference to the Book of Revelation’s account of the archangel, positioning this image before the entrance to the church was symbolically charged with obstructing demonic forces from entering. Such an intention is explicit in the inscription which accompanies a porch capital of the cathedral of Saint Vincent at Macon: “Demons recognise they are forbidden to enter. The angel is endowed with the gift to block the way”. Sources and Biblio: Rouergue Roman, Jean-Claude Fau, Zodiaque 1991. Deschamps Paul. Le décor d’entrelacs carolingien et sa survivance à l’époque romane, Comptes rendus des séances de l’Académie des Inscriptions et Belles-Lettres, 83ᵉ année, N. 4, 1939. pp. 387-396.